As any parent of inquisitive children knows, the answers to ‘simple’ questions, such as ‘what is everything made of?’ or ‘how did we get here?’ are usually anything but. 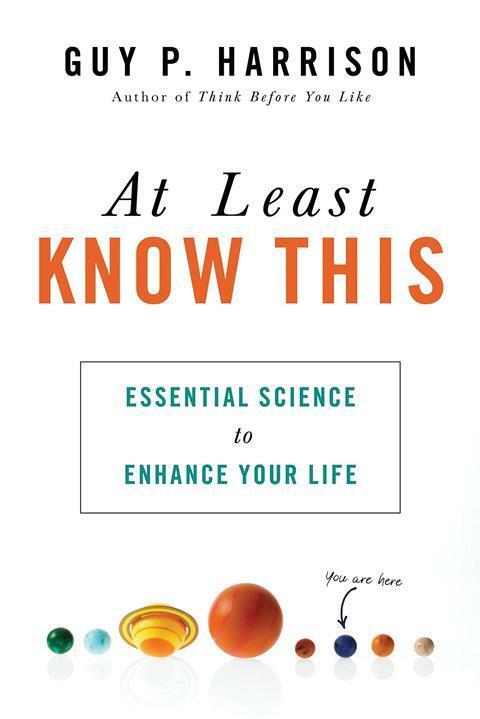 In At Least Know This, author Guy Harrison builds on this concept, unpicking the complex answers to straightforward questions. By addressing a variety of whens, whos, whats, hows, whys and wheres, he covers a wide range of topics. For example, in the When Did Everything Begin? chapter Harrison guides the reader through an introduction to the physics of our earliest universe, using quotes and anecdotes from Nobel prize winners and Nasa scientists to add that all-important human touch to the explanations. This worked well for me, and Harrison’s background as a journalist is a clear strength in an area where many would think being an expert on the subject matter is more important for a good read. Throughout the book, Harrison begins each chapter by sharing a personal story, or by asking a series of questions as a kind of brain warm up for the reader. Interesting facts and figures are used frequently, though not always wisely. For example, he compares the money being spent on a Nasa programme concerning asteroid threats to Earth with the greater figure of money spent on cosmetic surgery in the US each year. This sat uneasily with me, as I dislike the inference drawn between what is a ‘worthy’ expenditure and what isn’t to raise emotion. Elsewhere he comments that he regularly consumes liquidised leafy green vegetables, even providing a recipe because ‘science has shown that the ingredients are good for us’. In this case, few facts or hard evidence are provided to back up his claim. There are always subtle uncertainties in science and error margins in statistics; cause and effect don’t always correlate, but I didn’t get much of a sense of that from reading this book. It struck me that this thought-provoking, weighty volume might work better as a mini series like the hugely successful Very Short Introduction series. Harrison believes that if more people were science literate then we can fulfil our potential in a positive way. I am not sure, when apparently over half of all Americans believe in haunted houses (according to Harrison), how he expects to manage such a Damascene conversion with this text-heavy, slightly haughty manifesto.